Success as an athlete comes from a combination of athletic ability and our body build. The three components of body build are the type, size and composition. A system, developed by W.H. Sheldon (c.1940), uses the terms ectomorph, endomorph, or mesomorph to describe the body build of an individual. Beashel and Taylor (1997) identify three extremes of body types. Wider front to back rather than side to side. An endomorphic individual typically has short arms and legs and a large amount of mass on their frame. Their mass hampers their ability to compete in sports requiring high levels of agility or speed and perform sustained weight-bearing aerobic activities such as running. Sports of pure strength, like powerlifting, are perfect for an endomorph. They can gain weight easily and lose condition quickly if training stops. Narrow from front to back rather than side to side. A mesomorphic individual excels in strength, agility, and speed. Their medium structure and height, along with their tendency to gain muscle and strength easily make them a strong candidate for a top athlete in any sport. They can sustain low body fat levels and find it easy to lose and gain weight. A predominantly ectomorphic individual is long, slender and thin, and therefore power and strength sports are perhaps not suitable as their slight build leaves them susceptible to injuries. While they can easily get lean and hard, their lack of musculature severely limits their chances in sports requiring mass. Ectomorphs dominate endurance sports and gymnastics. They can archive low levels of body fat which can be detrimental to health and for females, in endurance sports, it can result in a cessation of periods and iron deficiency. Sheldon evaluated the degree a body type was present on a 1 to 7 scale where 1 is the minimum and 7 is the maximum. 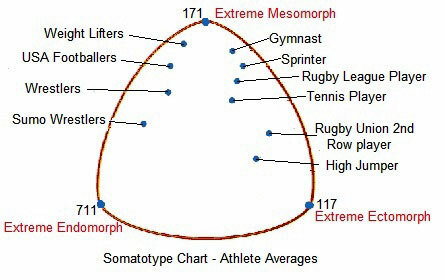 All athletes are made up of the three extreme body types so we are all part endomorph, part mesomorph and part ectomorph. Using a score of one to seven, we can grade our bodies on each of the extreme body types. e.g. two, six, three means: two (low endomorphy); six (high mesomorphy); three (low ectomorphy). In this way, we can compare our body type with that of other athletes. This method of body typing is known as somatotyping - height is not taken into consideration. The "perfect" bodybuilder would perhaps be a 173, while 475 might be better suited for football, and 147 a basketball player. Having scored in multiple body types, for instance, the football player's 475, does not mean he has all of the traits of each body type mixed together. It may mean he has the heavy thick build of the Endomorph combined with superior musculature and strength of the Mesomorph, with the above average height of the Ectomorph. Body size refers to the athlete's height and weight. The ideal size for an athlete depends on the sport or event and sometimes the position they play in their sport (consider the various body sizes in a Rugby team). There are standard ideal weight charts based on an individual's height. Body composition refers to the athlete's body fat. In most sports, the athlete will try to keep his/her levels of body fat to a minimum. In general the higher the percentage of body fat the poorer the performance. Research by Barbara Heath et al. (1967) identifies an alternative somatotype method for both sexes and all ages. COOPER, P. J. et al. (1987) The development and validation of the Body Shape Questionnaire. International Journal of eating disorders, 6 (4), p. 485-494. GREENBURGH, D. R. and LAPORTE, D. J. (1996) Racial differences in body type preferences of men for women. International Journal of Eating Disorders, 19 (3), p. 275-278.